Although being a death metal freak for 7 or 8 years, I have never been a fan of Hypocrisy and never bought any of their albums until the band released their best-of 10 Years Of Chaos And Confusion in 2001. At this time, I wasn't into death metal anymore, however still listening now and then to the classics among the classics of the genre. 10 Years Of Chaos And Confusion just blew me away. The band re-recorded almost all the songs featured on this album and hence brought something that sounded just like a new album (at least to me). Although I bought their three latest album s after this one, Catch 22, Into The Abyss and Hypocrsy (their 1999 eponymous album), I have never really been fully convinced by the band, although they have a great potential. What I like the most in Hypocrisy, it's their emphasis on the melodious, spatial side of their sound. Songs such as Fractured Millenium on Hypocrisy, or Uncontrolled on Catch 22 are hymns. I am not really fond of their fast track. I am not a fan of speedness in death metal anymore. 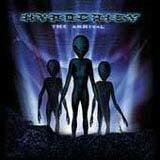 Fortunately for me, The Arrival, their ninth studio album, has this strong spatial feeling that I like so much. With such a title, it couldn't be any different anyway. I would like to say that very few songs are moving off of their spatial, super-melodic, atmospheric (who said experimental ?) unique style which makes this album a must-have. The doomy, dark melody, epic track The Abyss is probably what defines Hypocrisy to me and that's probably why Catch 22 and Into The Abyss disappointed me so much. There is no reason to be disappointed here with songs such as The Departure, Erased, Slave To The Parasites, The Abyss... it's all in all an almost perfect death metal album ! All the songs are nothing short of amazing, varied and memorable, brutal yet so melodic and melodic yet so #%&$ brutal. A total unpredictable album compared to Catch 22 or Into The Abyss, but yet so predictable when you compared it to Hypocrisy. There are chances that this album could become the strongest record Hypocrisy has put out so far, at least for those like me who like their atmospheric side. Chances are again that this album dethroned Hypocrisy in the heart of the loyal fans, those who, instead of me, like whatever the band does.